Promotes Complete Motivation & Drive to Create Prosperity & Wealth! This hypnosis session is designed to give you overwhelming motivation to do everything required to create abundance & prosperity. It is especially useful for people that already know what they want to achieve and how to do it, but just need that extra helping hand to put it all into action. This program overhauls a negative mindset that prevents reaching your financial goals and prosperity. You can expect to wake up each morning having complete belief in your abilities and doing all the right things with motivated action to reach your goals. This may be as simple as feeling inclined to spend and hour working on your business goals before you go to work, or to have the extra effort at work to push for that promotion. Through hypnosis you can quite literally re-train your mindset to adopt new patterns of automatic thought and action. 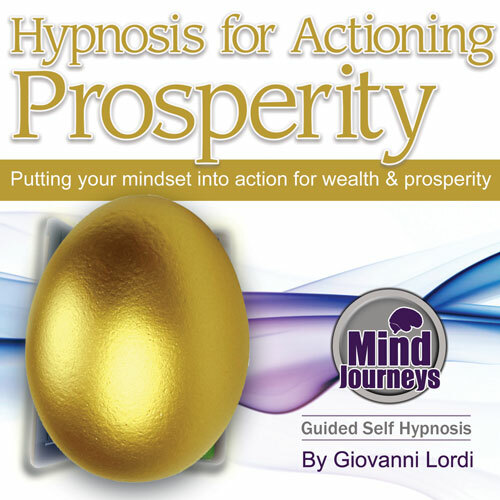 In this session Giovanni will help you apply this to the way you approach achieving prosperity. The positive suggestions, metaphors and subliminals all help reinforce a new approach at the deepest level to make this happen. Using this recording every night will make this happen more and more each day, until the end of the 6-8 weeks recommended to use it, where everything will be completely set in and automatic. "It is my right to be rich, I am wealthy, I am prosperity, I am happy, I am a powerful money reactor, I am a money multiplier, I can, I will, I am a leader, I believe in me, I make it happy"